My husband and I are expecting our first child in a couple weeks and we're trying to get Stori ready for the new member of the family. From the first day we got Stori we've always handled her as if a child would, pulling gently on her ears, jowls, tail, etc to get her to be okay with any kind of handling. We've had her around the bassinet, playpen, swing, and car seat so she gets used to them without baby using them, and we've taken her for walks with the stroller. I've carried things in my arms, to mimic holding a baby, and have played youtube sounds of newborns crying for her to get used to those as well. Our plan after baby is born, before we bring him home from the hospital, is that my husband will come home (we live 2 minutes away from the hospital) with a blanket that smells like baby and introducing the blanket to Stori first. Any other tips and advice or experiences? When we first brought Olivia home we put her right in the pack and play and then let the dogs come up and sniff her. She was in a safe place and they could have access to her. They were obvioulsy curious as to what this new crying wiggling thing was...but were very gentle with her. We of course were there at all times to supervise when the dogs were in the room. Another good way is to put the baby in a swing and let the Stori sniff her on her own. They also say for you to go in when you get home from the hospital and greet the dog first, because she will be excited to see you since you have been gone a couple days. Then have your husband bring the baby in when she is calmed down. My only other advice is to just include her in everything, don't make her feel like she's being blocked from the baby. The more she is around the baby the better she will and the more it will be just old news. I agree with Kristin and congrats on the new baby.. Thanks very much ladies We are pretty excited. Kristen, I love the pictures. 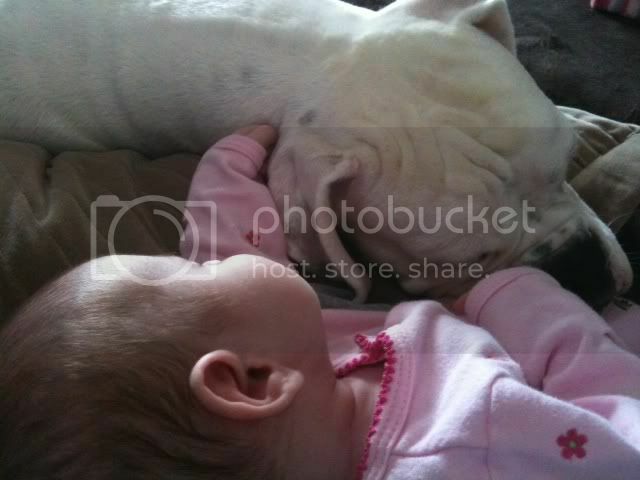 Stori has been around lots of kids before and she's very curious about them, especially the ones her size. She's good with them but they go home at the end of the day, lol. There was one day I was hosting a bridal shower for a friend and one of the guests brought their infant along and put the carseat with the baby in it on the chair. Stori walked up to the carseat and sat down and rested her head on the baby's legs, and just stared. So freaking cute. Aww how cute! I think she will be just fine then! The trainer told me that she worries more about toddler interaction with dogs then infants. Once they start becoming mobile is when the real trouble can start...the pulling, the climbing, etc. 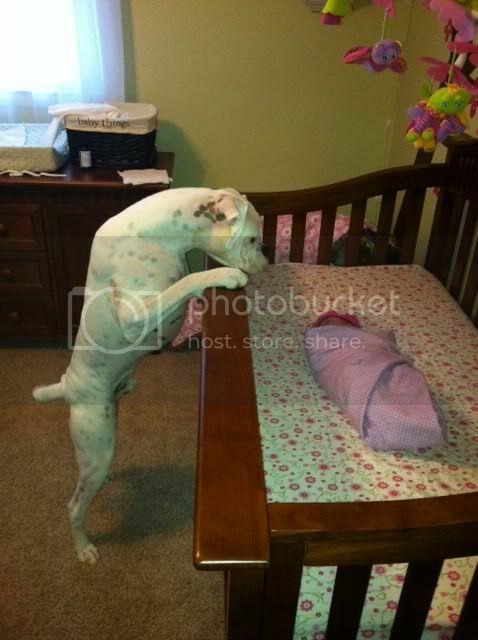 I think as long as you are aware of what the baby and dog are both doing you will be fine. Sounds like she will be fine. Congratulations! How exciting! Be sure to keep us posted, and we'll need photos of that new baby too!